Polish parts of your vehicle you never thought possible! FLEX PE8 Rotary Foam Pads, available in 1, 2, and 3 inch diameter, are specially designed foam pads for use with the FLEX PE8 Kompakt Rotary Polisher. FLEX PE8 Rotary Foam Pads utilize several design features that allow them to run smoother and cooler than traditional “one application fits all” foam pads. FLEX PE8 Rotary Foam Pads and their small footprint will give you the ability to polish parts of your vehicle you never thought possible! FLEX PE8 Rotary Foam Pads are constructed using an open-cell design that increases longevity by reducing heat. Compared to a closed-cell design, FLEX PE8 Rotary Foam Pads enable air to pass through them to cool the adhesives that are used to attach the backing material to the foam. FLEX PE8 Rotary Foam Pads will not only out perform other foam pads of their type, but they’ll last longer as well. FLEX PE8 Rotary Foam Pads feature a hook and loop material that is precision cut for easy centering on the appropriately-sized FLEX Rotary Backing Plate. Heavy Orange - This firm, dense pad is designed to remove swirl marks, scratches and oxidation. The firm composition is able to withstand pressure during extended polishing sessions. Medium Green - Use this pad with swirl removers and finishing polishes to create a mirror finish. Soft Black - The softest of the 3 pads, the black pad is ideal for ultra-fine polishes. This pad is perfect for "jeweling" the finish to create the highest level of gloss possible. 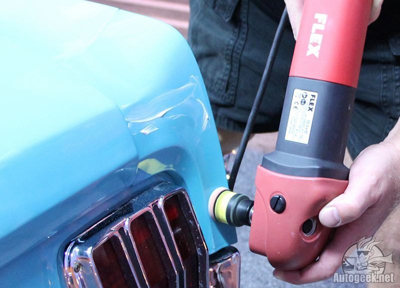 FLEX PE8 Rotary Foam Pads are beveled to create a smoother buffing experience. The beveled design greatly reduces buffer hop by distributing the pressure outward. This makes it easier for the operator to ensure 100% of the face of the pad is making contact with the paint, reducing the chance of instilling holograms. 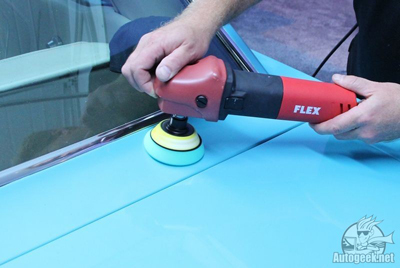 If you’re the proud owner of a FLEX PE8 Kompakt Rotary Polisher or FLEX PE14-2-150, pick up a set of FLEX PE8 Rotary Foam Pads and FLEX Rotary Backing Plates and experience smooth, precision polishing like you never have. For best results, we recommend using a Rotary Backing Plate Extension to increase the distance between the body of the polisher and the backing plate, increasing precision and safety.